Mei performed on Show 321 in Lake Jackson, TX, on March 4, 2016. 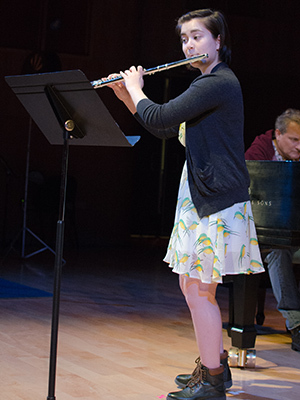 Mei Stone (flute), 17, is from Waco, Texas, and is currently a senior at the Interlochen Arts Academy in Michigan, where she studies with Nancy Stagnitta. She is a recipient of From the Top’s Jack Kent Cooke Young Artist Award. The daughter of a band director, Mei grew up surrounded by music. During her freshman year at Interlochen, she realized she wanted to pursue music as a career. She has performed in the Oklahoma Arts Institute Orchestra and the National Youth Orchestra of the USA. Outside of music, Mei enjoys reading books, making Japanese food with her mother, growing plants, and writing letters to her friends. Mei is a Jack Kent Cooke Young Artist.